A majority of wealthy investors switch their advisors at some point in their lives, and often they do so for reasons that don’t involve the bottom line. But there are those investors who only concern themselves with how the advisor is performing in the overriding task of making money and improving the investor’s portfolio. Advisors must determine immediately what the investor is looking for in terms of advisor performance. Many investors do prioritize communication over the bottom line, with greater concern for knowing what is going on with their money over the way the investments are performing. But for some investors, it is all about the bottom line, and advisors need to know who they are. Spectrem’s research report, Why Investors Switch Advisors, explains why investors are likely to look at the bottom line above all other aspects of the investor-advisor relationship. Asked to select the primary reason they switched advisors, 22 percent of investors did so because the advisor was under-performing compared to the overall stock market. That response was third on the list of reasons, and the first to relate to the bottom line over matters like communication and responsiveness. 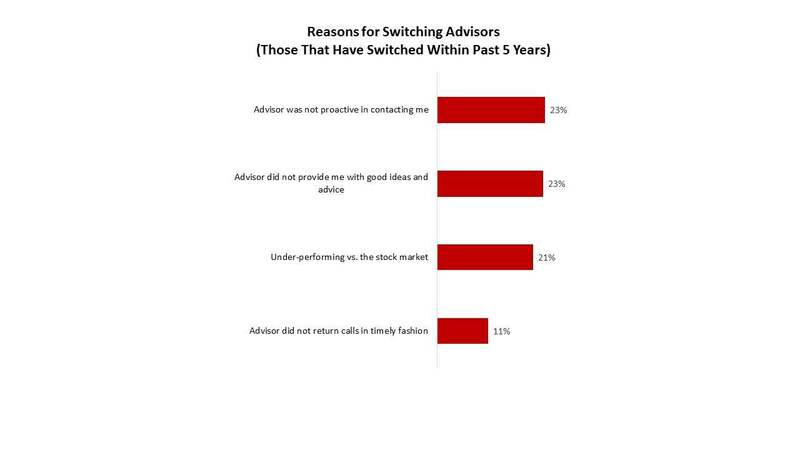 There are characteristics specific to those investors who switch advisors due to poor investment performance. For example, the oldest investors surveyed in the report, those over the age of 68, are most likely to be looking at investment performance when making the decision to switch. Due to their age, they are at the point in their lives when what matters is providing for themselves and their families financially above all else, which is why they care about their own net worth. Investors with a fair knowledge of investing are also most likely to switch advisors who are not doing well with their selected investments as compared to the overall stock market. These knowledgeable investors are more likely to be keeping an eye on circumstances and events affecting the investment markets, and are more likely to be the ones obtaining information from reading financial articles. Do you work with an investor who likes to be hands-on in regards to investing, and is likely to do some online trading himself? That is another investor who is likely to switch advisors based on their bottom line performance. What is surprising is that for some investors, the bottom line does not play into their relationship with their advisor at all. When asked to select all of the reasons they would switch their advisor, only 43 percent of Millionaires (those with a net worth between $1 million and $5 million) chose “advisor is under-performing compared to the overall stock market”. There is one area in which investment performance does play a role, and that is in satisfaction with fees and commissions. In Spectrem’s research report Advisor Relationships and Changing Advice Requirements, approximately one-third of all investors said they were unconcerned about the fees they pay to advisors as long as their assets are growing. That percentage increases as wealth increases. Know your investor. If the bottom line is all that matters, concentrate on that for that particular client. If they have other expectations, including a desire to have constant communication, note that and make phone calls or emails a part of your routine regarding that particular client. Ask questions about just what investors want in terms of “outperforming the market”. What numbers are they looking at, or are they looking at all? Your more knowledgeable investors will have specific answers for you in that regard.